WASHINGTON (May 05, 2003) -- A new program will help airmen honor those who are often their biggest supporters -- their parents. All uniformed airmen can now sign their parents up to receive a new lapel pin. 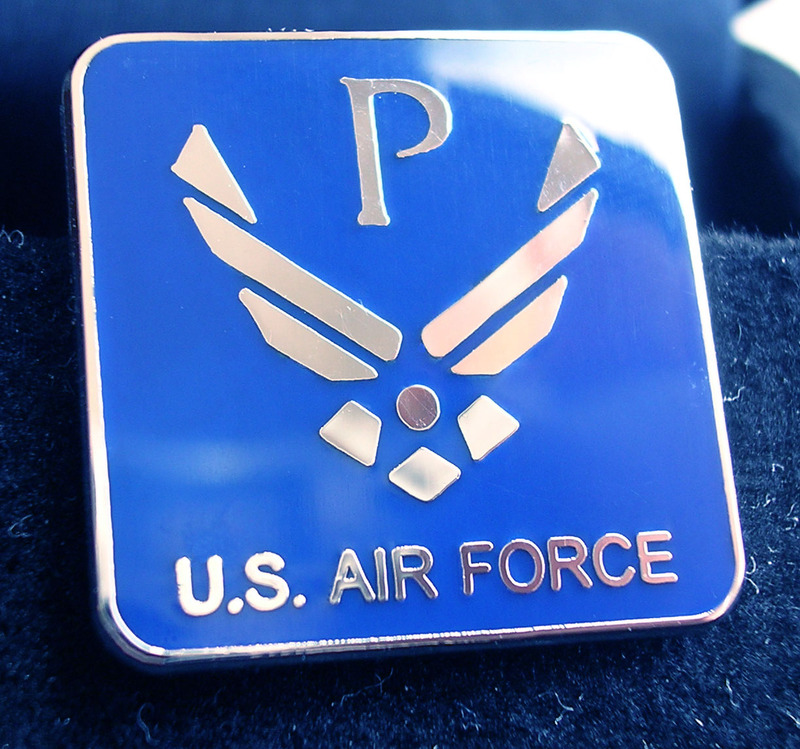 The pins are about three-fourths inch square and feature a silver letter "P" cradled within the Air Force symbol. Airmen can now sign up to have a pin like this sent to their parents. A personalized letter from Secretary of the Air Force Dr. James G. Roche and Air Force Chief of Staff Gen. John P. Jumper will accompany the pin and thank parents for their support. A personalized letter to the parents from Secretary of the Air Force Dr. James G. Roche and Air Force Chief of Staff Gen. John P. Jumper will accompany the pins. “We could not protect America’s freedom without the incredible people who are willing to carry on the Air Force tradition,” the letter reads. "As the proud parents of one of those airmen, your support continues to be critical to our ongoing efforts and makes a real difference to our country." "This is a way to build and maintain public support for the global war on terrorism," said Brig. Gen. Edward Tonini, director of Your Guardians of Freedom, the Pentagon office responsible for the parent pin effort. "Demographically, the people most likely to wear the pin with the greatest amount of pride -- to church, to Rotary Club meetings or to the grocery store -- are our parents. "By wearing this pin, parents will let you know of the pride they have in you," Tonini said. "When they wear that pin out, their friends will ask about it. Your parents will tell them about you and your service, and how proud they are of you." Those who would like their parents to receive a pin can sign up at the Your Guardians of Freedom Web site at http://www.yourguardiansoffreedom.com. Signing up will require airmen to enter the names and addresses of up to two parents or parental figures, Tonini said. The program is voluntary and comes at no cost to those participating. The distribution of the parent pin and accompanying letters is the second major effort by the relatively new Your Guardians of Freedom office. The first was the employer pin campaign, started in November 2002, in which pins featuring an "E" and personalized letters are sent to the civilian employers of Air National guardsmen and reservists. Both pin programs are contemporary adaptations of public support campaigns carried out during World War II. The Your Guardians of Freedom program is designed to continue those traditions by ensuring the continued support of Air Force activities by those who do not wear the blue uniform, but stand behind those who do, Tonini said. The employer pin program is ongoing, and reservists and guardsmen can still sign their employers up at the Your Guardians of Freedom Web site.